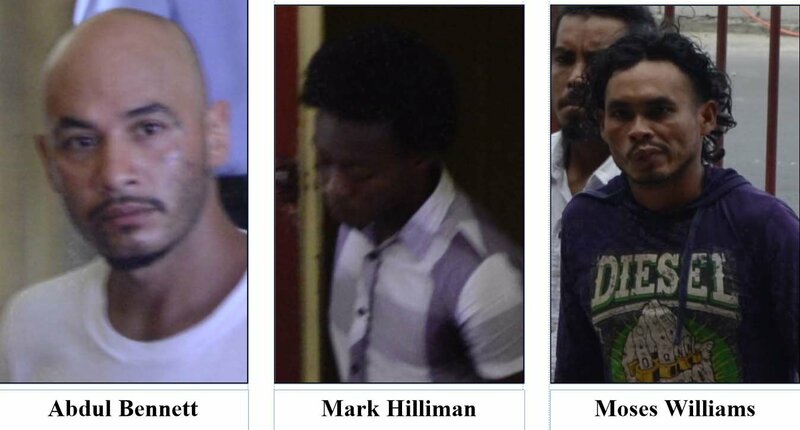 Three men were yesterday remanded to prison after appearing before Chief Magistrate Ann McLennan at a city court on separate charges of cannabis possession for trafficking purposes. Abdul Bennett, 38, of Lot 30 Stone Avenue, was accused of having 672 grammes of cannabis in his possession on December 14, for the purpose of trafficking. Bennett was alleged to have been in possession of the narcotics at Stone Avenue, Campbellville. The defendant pleaded not guilty to the charge and was remanded to prison until January 11, when he will make an appearance before Magistrate Judy Latchman in Court 3. Also on remand is Mark Hilliman, 17, of Lot 88 Better Hope, East Coast Demerara, who was charged with having 15.4 grammes of cannabis for the purpose of trafficking. The defendant, who was represented by Attorney Paul Fung-A-Fat, had his bail application denied after entering a not guilty plea. Hilliman is expected to return to court on January 12, before Magistrate Fabayo Azore in Court 5. A Bartica saw operator was the third to be placed on remand on a charge of trafficking yesterday after he was accused of having 39 grammes of cannabis for trafficking in his possession at Kurupukari Crossing, Essequibo River. The accused, Moses Williams, 29, of 72 Miles Bartica, pleaded not guilty to the allegation and was remanded to prison until his next court appearance at the Lethem Magistrate’s Court on February 29.